The Body Politic: Tony Abbott's Problems explained. It was Halloween Yesterday, when the spirits of former persons scour the earth, looking for a body to inhabit. Perhaps that explains Tony Abbott's behaviour yesterday. As "The Age" reports: On a day that the Government had hoped would be dominated by its $310 million health plan, Mr Abbott's behaviour became the central theme after he insulted a dying asbestos campaigner and arrived 35 minutes late for a debate at the National Press Club. In my opinion, Tony Abbott has always been a liability to the Government. It is time that Mr Howard silenced him. If it were not for Abbott's personality deficits, Abbott might well have been leader today. After all, Howard has a deep and abiding loathing for Mr Costello, And Abbott is a NSW based politician, and Howard likes that, after the traditional Victorian emphasis in the Liberal Party. 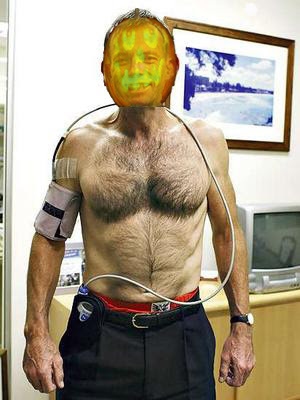 Here is Tony, in a secret Medical Laboratory, being fitted for his new head, for Halloween. 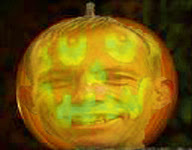 Why should the Evil Spirits inflict Tony on us? Its not fair. Take him back, please. Then again, it is probably good that on Halloween he lets his true nature shine through, just a little, so the Media can see him for what he really is. A nasty piece of work. Arrogant, and a misogynist. Sunset of a Career? D Day today. Government funded the late Kerry Packer. Howard's End? Renovate the bathroon, pls. Peter Andren MP - RIP. A decent man.